A hot stone massage at Pathway to Serenity starts off like a sports massage, deep tissue massage, or therapeutic massage. 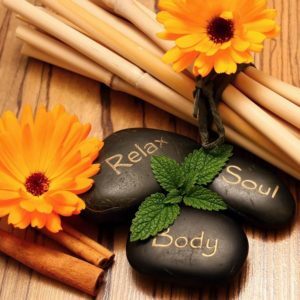 After decompressing in the relaxation center with a hot cup of tea your massage therapist will want to discuss the areas of the body you are experiencing the most pain or stress. They will then ask how much pressure you would like applied during the massage. The therapist will leave and give you the chance to get comfortable. Once you disrobe you will want to get under the sheets and lie face down on the massage table. To begin the massage the therapist will fold back the sheets on your back and then place a small towel on your back. They will then place a row of heated basalt stones down your back on your spine. These stones are heated in a certified stone heater to regulate the temperature. It keeps them somewhere between 120 and 140 degrees. The basalt stones are volcanic rock known for holding in heat and generally, they have been smoothed by a river. After a few minutes, the heat will begin to relax the back muscles. It also serves as a natural pain reliever which will allow the therapist to apply deeper pressure without causing discomfort. This will allow access to deeper muscles and tissues. As the heat begins to take effect the therapist will rub oil on your legs and on another set of stones and begin massaging your extremities. Like in a typical therapeutic massage, the therapist will use the same massage strokes. The stones are held in the hands of the therapist during the massage. The edges are used to perform the massage. The stones stay in constant motion so as not to burn your skin. Be sure to communicate with your therapist throughout the massage. If the stones are too hot, they can speed up, move to another part of the body that can handle the heat, or pick up another set of stones. It’s okay to ask for more, or less, pressure during the massage. During the massage the stones may be placed on different areas of the body depending on where the pain or stress resides. Stones can be placed along the spine, in the palms of the hand, on the legs, abdomen, feet, between the toes, between the fingers, and under the arms in the armpit. These stationary stones are never placed directly on the skin. Due to the heat, a hot stone massage does cause a deeper relaxation. However, a hot stone massage can not access as many muscles and tissues like hands can during a therapeutic massage. A hot stone massage isn’t right for everyone. Consult a doctor before getting a hot stone massage if you have high blood pressure, diabetes, heart disease, varicose veins, migraines, autoimmune disease, cancer, epilepsy, tumor, metal implants, or on blood thinners. Pregnant women and children should never get a hot stone massage. A hot stone massage is a great way to rid the chill of the winter!